Recently I was offended by the sheer vulgarity of the Vetements collection. The label, whose namesake translates as clothes. I argued that they shouldn’t be showing at Paris Fashion Week. 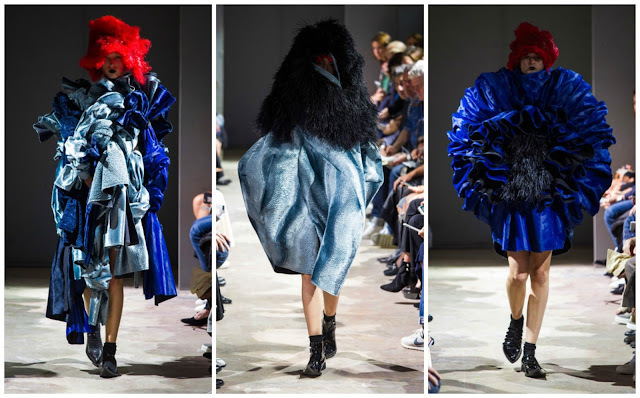 A woman whose label is undeniably fashion, and not clothes, is Rei Kawakubo’s Comme des Graçons. I’m going to be wholly honest: I don’t fully get Comme. Previously I was bemused by the creations of Kawakubo. The audacity of sending models down the runway in clouds of heavily constructed garments. I say clouds because they certainly aren’t form-fitting. Perhaps it’s the conceptualism at play that I fail to comprehend. However, I’ll try to remain objective in this review. For Spring 2016, the collection was entitled Blue Witches. 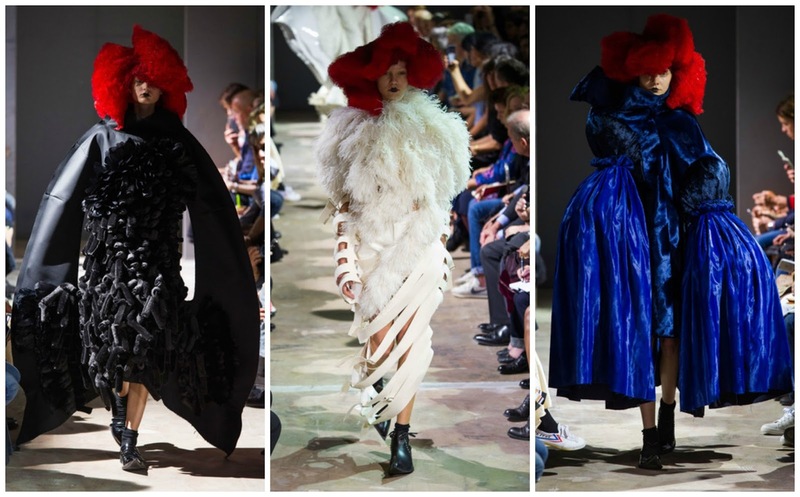 Kawakubo’s husband declared them “powerful women who do good in the world.” Not exactly the portrayal of witches as we’re used to. Ironically, the first model emerged in black ‘suit’. Boasting black velvet nuggets and a plume of feathers, the model looked like a winged creature. A shapeshifting witch. The uneasily identified arms of one look belonged to a shimmering midnight blue coat. ‘She wore blue velvet.’ Look 12 was a ‘dress’ that boasted tens of knotted blue velvet. Ice, electric, midnight and sky blue all came together in this look. Cocooned in a metallic faux-leather, was a black fur accented ‘coat’. The final look was a gargantuan ‘coat’ in an icy blue and with black fur. Rei Kawakubo is a purveyor of experiential fashion design. Since founding her label in 1973, she has completely rebuked conformity and marches entirely to the beat of her own drum. The best thing about a Comme des Garçons collection is the unpredictability. I use the word ‘unpredictable’ in other reviews, but this is it in its truest form. You don’t know what to expect or you have no expectations. Like it or not—I didn’t like a lot of it—it was an unforgettable experience.